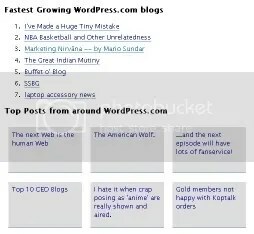 3rd Fastest Growing WordPress Blog! Out of a total of 254,000 blogs on WordPress, who would you thank if your blog shot up as the 3rd fastest growing blog of em all. In my case, I have to THANK Jason Calacanis — of Weblogs, Inc. for his shout-out that reverberated across my blog stats. All this rapid blog activity, of course, is due to a referral from an influential blogger such as Jason. A-HUGE thanks to Jason as well as to all the other bloggers who have been very generous in welcoming me to the blogosphere as well as linking to posts of mine that they believe deserve some attention. In particular, I’d like to thank Jeremiah (Web Strategist Blog), Ben & Jackie at the Church of the Customer blog (one of the early marketing referrers), and my Viral Community (Mack, Ann, David, Karl, and the rest of us) whose appreciation and constant support has made this journey enjoyable. I know that this spurt in traffic is solely indicative of Jason’s pull within the blogosphere, but as a rookie blogger, I believed I’ve accomplished my primary task – to capture the attention of the pros. I hope that moving forward, I’d be able to sustain the attention that has been lavished on this blog, through a set of innovative features that’d help brand my marketing blog. Keeping in mind, the enormous attention my Top 10 CEOs blog post has garnered, as any sane marketer would do, I’ve decided to solidify it as a permanent monthly fixture (a la – Mack’s Top 25 Marketing Blogs). Also, owing to my interest in corporate blogging, I’m planning on adding a Top 10 Corporate Blog listing every month. With advice and suggestions from marketing blog thought-leaders such as Mack, I hope to finalize a method for the rankings themselves (Alexa/Technorati?). More details soon. Who knows, down the road, a Top 10 Corporate Podcast listings may become viable. Until then, check out this brand new Dell Corporate Blog that was launched today and read ALL about it here. Mario, thanks for the regular service, it is great to have a CEO blogobserver! Do you think they could be interviewed on the beginnings (how they have decided to risk)? That sure is a good idea. Also, I’m scouring the web for more CEO blogs to make the list more comprehensive. Thanks for reading and for blogging! That’s be sweet. Mack’s Top 25 & Tech Meme are my two goals right now. Nice job Mario!! Kudos for the Jason shout out! As I mentioned in the viral marketing community post that you reference in your top 5 corporate blogs post, we need a “maven” for corporate blogs similar to what Mack is doing for marketing blogs. I can only applaude the initiative and hope to make the top 10! Thanks, Eric, for your kind words. I’m pleasantly surprised & enthused by the warm reception that the Top 10 CEOs idea has received. It seems like there’s a genuine interest in corporate blogs that needs to be fulfilled. Hopefully, my endeavor will help monitor the pulse of corporate blogs. Congrats on the huge progress you’ve made in such a short time! It couldn’t have been possible without our Viral Community! Congrats. This is really great news. I look forward to your insight and comments on Marketing Nirvana, down the road. You’re rocking man –this is fun to watch. It’s more fun with the company of bloggers such as yourself. you’re on your wway to top! !..two thumbs up for you!! Buon luogo, congratulazioni, il mio amico!